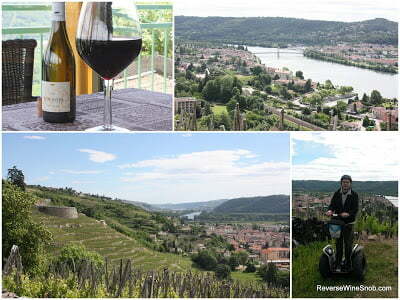 Exploring the amazing sights and tastes of the Northern Rhone Valley. 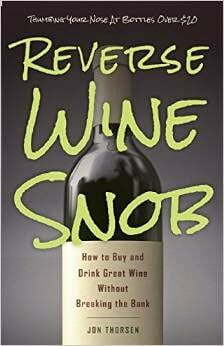 Includes an overview of the Cotes du Rhone appellation and its designations. Earlier this year I was invited by Atout France to partake in what amounted to a wine-lovers dream trip — an exploration of the Rhone Valley from north to south. Today is the first half of what will be a two part series detailing our adventures! Check out Part Two focusing on the Southern Rhone here! Before we get to the recap of our amazing trip, let’s look at a quick overview of the Cotes du Rhoneand all of the appellations within. The most prestigious designation with the Cotes du Rhone are the 18 Crus which are broken out into 8 Northern Cru, 8 Southern Cru plus 2 Crus for fortified wine that are in the Southern Rhone. After this comes the Cotes du Rhone Villages appellation and then the basic Cotes du Rhonedesignation. 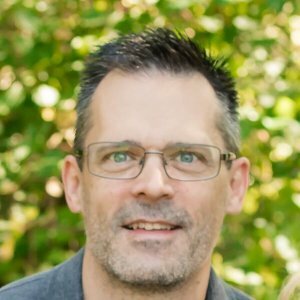 Here’s how it all breaks out. 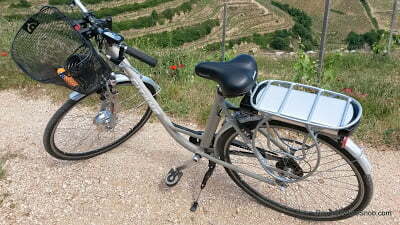 Farthest north is Cote Rotie, which is known for its extremely steep terraced vineyards. 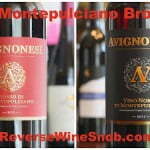 The region produces red wines made from Syrah that are allowed to also have up to 20% Viognier. Just to the south is Condrieu which exclusively produces Viognier. 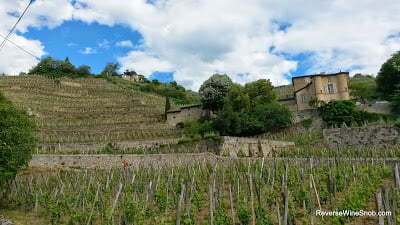 This area, like many in the Northern Rhone, is known for its steep terraced vineyards. Next is the tiny Chateau-Grillet which is entirely owned by a single winery, the aptly named Chateau Grillet. This appellation also only produces Viognier. Further south down the river you come to Saint-Joseph which produces reds and whites. 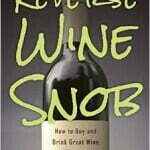 Reds are made from Syrah (with up to 10% Roussanne or Marsanne) and the whites are made from Roussanne and Marsanne. 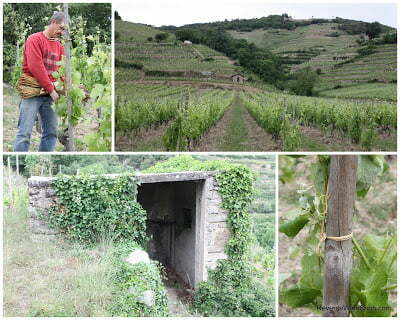 The next two regions are Hermitage and Crozes-Hermitage. 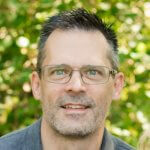 Both areas produce similar red (Syrah with up to 15% Roussanne or Marsanne) and white (Roussanne and Marsanne) wines. The primary difference between the two is that for the most partHermitage sits at the top of the hills and consists of the sloped, terraced vineyards while Crozes-Hermitage makes up the surrounding area, much of it the valley floor which is relatively flat. 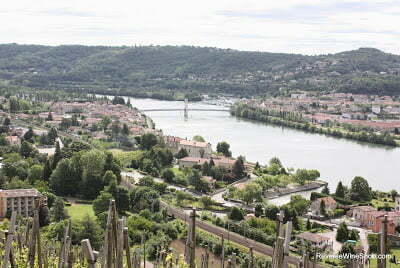 Crozes-Hermitage is the largest of the Northern Rhone appellations. Further to the south comes Cornas, a relatively small but again very prestigious area that exclusively produces Syrah. Beaumes-de-Venise spreads out over the southeast side of the Dentelles de Montmirail Hills. 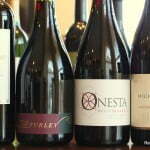 The area produces red wines made primarily from Grenache, Syrah and Mourvedre with up to 5% white varieties allowed. This area is protected from the mistral wind that rules over so much of the Southern Rhone so it gets quite hot. There is also a separate Muscat Beaumes-de-Venise appellation for the fortified wines made from Muscat. Chateauneuf-du-Pape is perhaps the best known appellation in all of the Rhone Valley. Both whites and reds are produced. 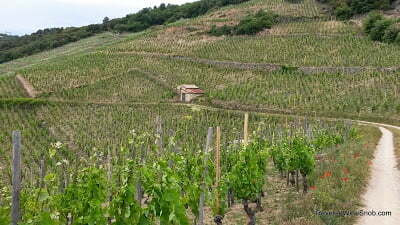 Gigondas is another renowned area in the Southern Rhone that produces only red and rosé wines, primarily from Grenache. 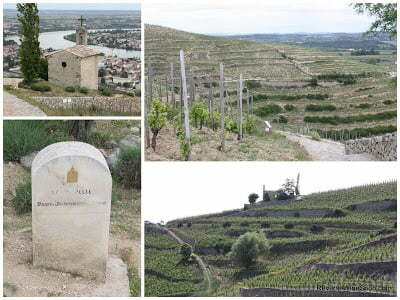 Lirac, on the right bank of the Rhone, produces both red and white wines. Rasteau, north of Gigondas in Vaucluse, produces red wines. There is also a separateVDN Rasteau appellation that produces red and white fortified wines. Tavel, which lies on the right bank of the Rhone next to Lirac, exclusively produces rosé wines. 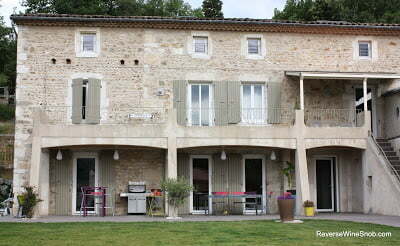 Vacqueyras lies just in between Gigondas and Beaumes-de-Venise at the foot of the Dentelles de Montmirail. 97% of the wines produced here are red wines containing at least 50% Grenache. Vinsobres, which was elevated to Cru status in the mid-90s, produces only red wines. After the 18 Crus, the next level down is Cotes du Rhone Villages. These areas make red (from Grenache, Syrah and Mourvedre primarily), white (from Grenache Blanc, Clairette, Marsanne, Roussanne, Viognier and Bourboulenc primarily) and rosé wines. There are actually two distinct levels within this designation — while much of the wine produced is simply labeled as Cotes du Rhone Villages, 18 villages have the right to include their names on the label due to their special characteristics. The named villages are: Cairanne, Chusclan, Gadagne, Laudun, Massif d’Uchaux, Plan de Dieu, Puymeras, Roaix, Rochegude, Rousset-les-Vignes, Sablet, Saint-Gervais, Saint-Maurice, Saint-Pantaléon-les-Vignes, Séguret, Signargues, Valréas, and Visan. At the bottom of the pyramid is the basic Cotes du Rhone designation which accounts for over 50% of the production in the Rhone Valley. Don’t go thinking these are necessarily lesser quality wines however — there are a lot of reasons a wine may be classified as Cotes du Rhone and not all of them have to do with quality. There is a tremendous amount of value to be found in the Cotes du Rhone designation as we will see in part 2 of this series. Red, white and rosé wines are all found here. Reds and rosé wines must use at least 40% Grenache (excluding Northern wines based on Syrah) and 80% of the whites wine must be made up of Grenache Blanc, Clairette, Marsanne, Roussanne, Bourboulenc and Viognier. My journey through Northern Rhone began bright and early with a Segway ride through Condrieu,Chateau-Grillet and Cote Rotie. 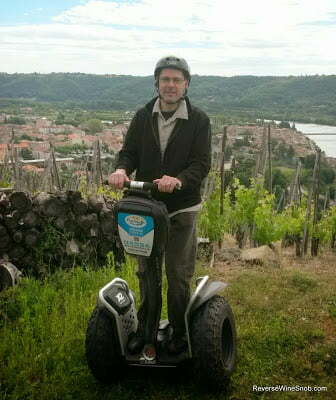 I was a bit worried that jet lag, riding a Segway for the first time, wine tasting along the way and steep terraced vineyards could add up to a recipe for disaster but the Segway was actually the perfect method to easily get up those big hills! The tiny appellation of Chateau-Grillet. Along the way we stopped for an excellent wine tasting at Domaine Remi et Robert Niero, which of course included some excellent local cheese called Rigotte do Condrieu. 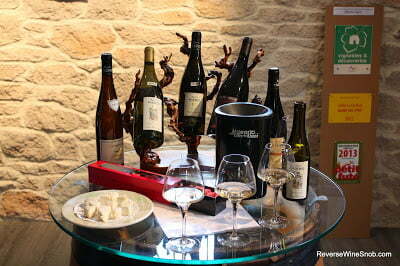 Tasting wine and eating cheese at Domaine Remi at Robert Niero. Tasting the wines of Chateau Corps de Loup. From there we went to explore Hermitage and Crozes-Hermitage with a tasting at one of the biggest wineries in the area, Maison Paul Jaboulet, famous for “La Chapelle” on the property. In the 13th century a knight coming back from the crusades asked for a piece of land to build a house. After he died monks built a chapel in memory of him. Paul Jaboulet bought this property in 1919. I should also pause here and address what some of you may be thinking — what is someone who thumbs his nose at bottles over $20 doing in the Northern Rhone? It’s a valid question as much of the wine made here retails over our limit in the U.S. And while that may be true, there is still value to be found here (check out tomorrow’s post for a great find under $20 from one of the Northern Rhone crus). I also have no issue spending over $20 for a Saturday Splurge wine if that price is merited, and after visiting the area and the incredibly steep hillside vineyards there’s no doubt in my mind that many of the offerings from the area are priced very fairly (especially if you buy them in France) given the high production expense. And lastly, I would also be remiss if I did not point out that the Northern Rhone is the inspiration and the bar for much of what is happening in the rest of the wine world. Getting down the hill from Hermitage proved quite fun as well, thanks to electric bikes which are an awesome way to effortlessly experience the area. My ride down from Hermitage. 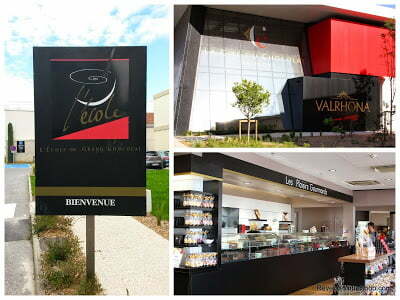 Next up was a special treat — a visit to Valrhona’s Cite du Chocolat in Tain l’Hermitage! A museum with interactive displays (interactive meaning you get to eat chocolate) explaining the process of making chocolate (which is very much like wine), a store with unlimited samples and even a chocolate school for chefs. This is definitely a treat not to be missed but don’t eat much beforehand and plan on spending a lot. The chocolate is some of the best I’ve had and extremely hard to find (and very expensive) here in the States. I wish I would have bought more to bring home. The chocolate lovers dream destination. The first day ended (yes, this was all in one day!) 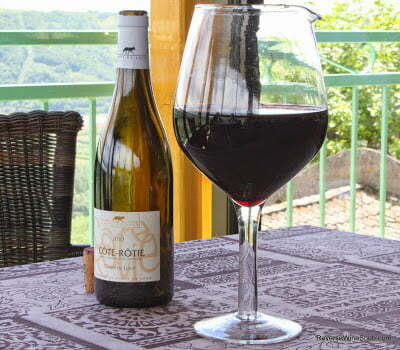 with dinner, more wine tasting and a stay at theCoeur de Vignes B&B in Saint-Peray. The wine tasting was extensive, the food was exquisite and the rooms were modern and comfortable. A relaxing stroll through Cornas. There we found workers tying up the vines the old-fashioned way, with reeds. This is, in fact, the same way they’ve done it for years, even back when the vineyard workers would stay in the little huts interspersed throughout the area. Scenes from the vineyards of Cornas. From there we stopped for tasting at Alain Voge, the winery owned by the man who helped to revitalize and put Cornas on the map. 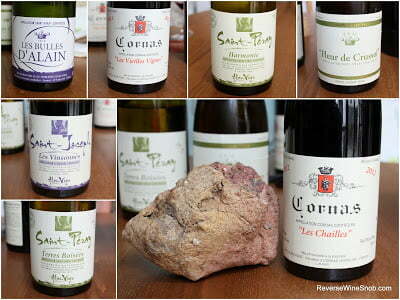 It’s easy to see why when tasting his excellent selection of wines from Saint-Peray, Saint-Joseph and of course Cornas. The excellent selection of wines from Alain Voge. If you visit the area, there’s a special treat in October in the form of a huge festival in Cornas. 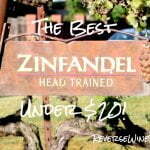 Another great time to visit is during the market at the end of November — for many of the wineries in the area this is the only chance to taste and buy their wines as they sell out so quickly. My whirlwind tour through Northern Rhone ended with a visit to Chateau de Crussol in Saint-Peray. 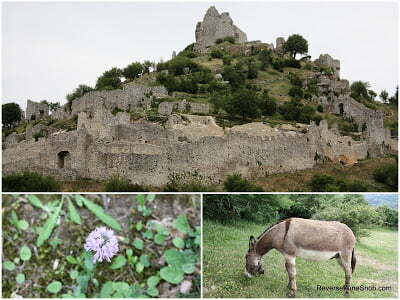 The castle was abandoned in the 15th century, but you can still go all the way to the top. At the right time of year the surrounding area is full of wild lawn orchids which are protected by French law. Donkeys patrol the area to keep the grasses and weeds at bay since they don’t like to eat the flowers! Chateau de Crussol in Saint-Peray. No visit would be complete without a multi-course meal, this time a lunch at Auberge des Trois Canard. 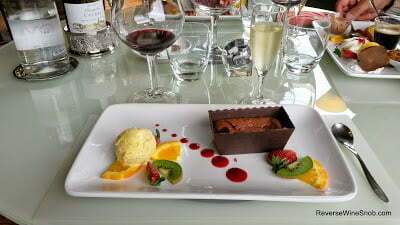 It ended the way all lunches in France seem to end, with an assortment of delicious desserts. Lunch at Auberge des Trois Canard. And with that, we moved on to our exploration of the Southern Rhone. 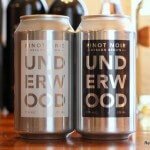 Also check out this great Northern Rhone value pick!